Healing meals is chock-full of fast and clean recipes, and gives you tons of inspiration and practical guidelines on how to create your own finger-lickin’ dishes. This is extra-ordinary food that will nourish, refresh & heal your body, mind & spirit. 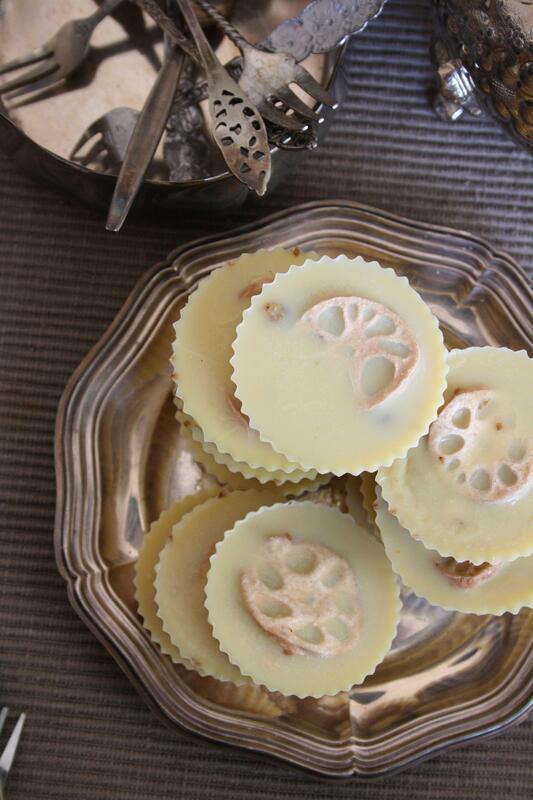 My lotus white chocolate is, by far, the most exotic recipe from the book. I wanted ‘healing meals’ to show how everyday, easy-to-get and affordable foods can be the most powerful and tasty medicine you’ve ever come across. But you know what? You sometimes have to splurge. There’s a time for contracting and simplifying and there’s a time for expanding and indulging. My lotus white chocolates will help to accomplish the latter and make your taste buds do their happy dance! Now off to the kitchen you go to practice the art and joy of homecooking! Pour hot water into a sauce pan & place a bowl in/over it. Make sure the inside of the bowl remains dry & the outside bottom touches the water. Place cacao butter in & let melt. This technique is called au bain marie. Add coconut blossom sugar to liquid cacao butter & use steel whisk or fork to mix together. Add vanilla extract & mix well. Place mulberries, cashews & sea salt in food processor & pulse until fine chunks appear. Add to cacao butter mixture. Mix in. Distribute mixture over four (silicon) (muffin) moulds & place one dried lotus chip in each of them. Make sure the lotus stays near the top of the chocolate otherwise you won’t see it when set. Let cool at room temperature for an hour or so. Place in the fridge until fully solid. Serve or store. Tips: *you may choose to use raw or activated cashews. To bring out extra cashew flavour roast them shortly in a dry skillet at low heat. Store chocolates chilled when weather is hot. These make wonderful (holiday/birthday) gifts!